All-new 700PS+ Mustang Shelby GT500 is the most powerful Ford production car ever! That's right. The 2020 Ford Mustang Shelby GT500 has been finally unveiled at the Detroit Auto Show and it very well lives up to the hype built around it. 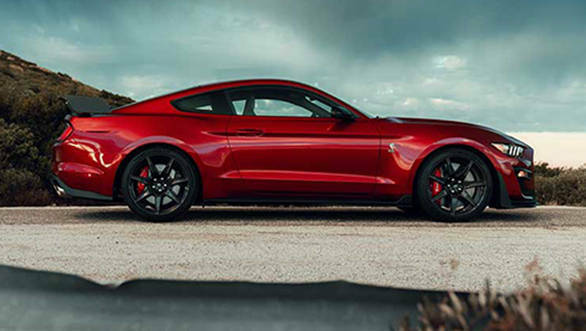 Ford mentions that it is the quickest street-legal acceleration and most high-performance technology to date ever offered in a Ford Mustang. 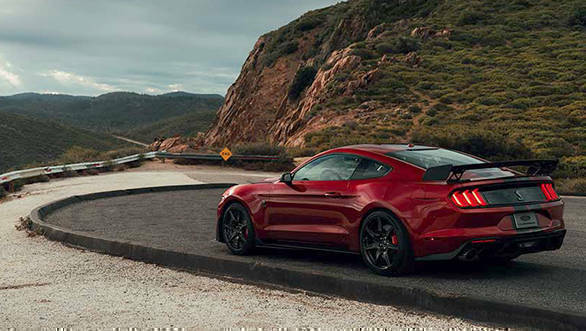 Race-bred chassis, custom Michelin tyres and the largest front brake rotors ever available on an American sports coupe are some of the highlights of the all-new Mustang Shelby GT500 that should help it scorch race tracks. Ford claims that the GT500 can touch 60mph in mid 3s and will do quarter mile drag in less than 11s. Ford has confirmed that the Mustang Shelby GT500 will arrive at international dealerships by the end of this year. Ford has still not revealed the pricing which we believe will be announced closer to the launch of the car. In terms of design, the Mustang Shelby GT500 gets a large angular grille openings and muscular hood that claims to have been inspired by modern fighter jet aircraft. The wider front fenders and stance house the Shelby GT500-specific 20x11-inch front and 20x11.5-inch rear wheels. The muscle car now comes with a standard rear spoiler along with updated composite materials in the rear diffuser result in added thermal management. Ford mentions the front fascia openings are more than doubled that of the Shelby GT350, while six heat exchangers increase cooling pack airflow by more than 50 percent. A massive 31x28-inch louvered hood vent features a removable aluminum rain tray for better air extraction and increased downforce. 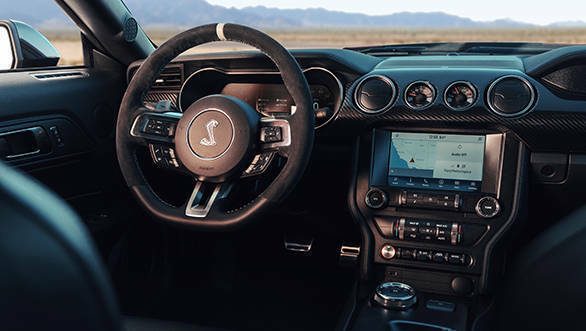 The cabin of the 2020 Ford Shelby GT500 boasts of a race-inspired cockpit with premium materials and unique finishes worthy of its world-class power. The other premium bits in the cabin include carbon fiber instrument panel and new door panel inserts in dark slate miko suede with accent stitching. The cabin comes with Recaro racing seats with firm side bolstering and pass-throughs for safety harnesses. Additionally, power-adjustable seating with Miko suede inserts is offered. The all-new Shelby GT500 is equipped with an 12-inch full-color LCD instrument cluster, along with a high-performance custom-tuned 12-speaker B&O Play premium audio system. All of this is controlled with the help of an 8-inch Sync3 touchscreen featuring SiriusXM and FordPass Connect. The 2020 Ford Mustang Shelby GT500 is powered by a supercharged 5.2-liter aluminum alloy engine built by hand. Ford claims to keep the intake air cooler and deliver a lower center of gravity, the team inverted a 2.65-liter roots-type supercharger with air-to-liquid intercooler positioned in the V8 engine valley. Like Shelby GT350, the aluminum alloy block features weight-saving wire-arc cylinder liners and high-flow aluminum cylinder heads, plus larger forged connecting rods, improved lubrication and cooling passages. 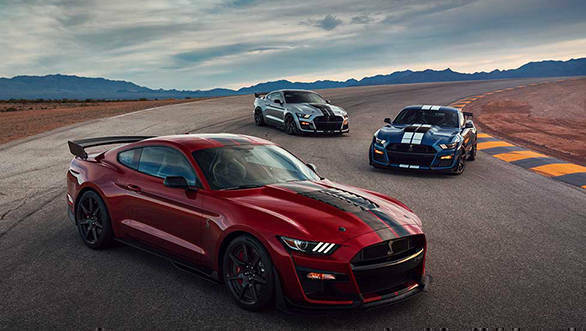 "With its supercar-level powertrain, the all-new Shelby GT500 takes the sixth-generation Mustang to a performance level once reserved only for exotics," said Hermann Salenbauch, global director, Ford Performance vehicle programs. "As a Mustang, it has to be attainable and punch above its weight. To that end, we've set a new standard among American performance cars with our most powerful street-legal V8 engine to date, plus the quickest-shifting transmission ever in a Mustang for all-out precision and speed." While purist might be disappointed with Ford for not offering a manual transmission, the Mustang Shelby GT500 makes use of Ford GT supercar's dual-clutch transmission that has been developed by Ford Performance. 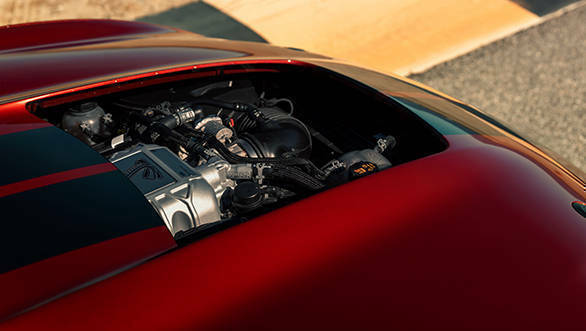 The company mentions that the engine will make use of Tremec 7-speed dual-clutch transmission, which is capable of shifts in under 100 milliseconds making it faster than any manual gearbox. It comes with drive modes, including normal, weather, sport, drag and track, and activates features like line-lock and launch control through selectable Track Apps. Further, the muscle cars gets next-generation active MagneRide suspension system with drive mode technologies from Ford Performance. For the performance seeking, Ford Performance offers two handling packages that consists of adjustable strut top mounts and spoiler with Gurney flap. The carbon package consists of 20-inch carbon fiber wheels with 0.5-inch-wider rear wheels (11.5-inch), custom Michelin Pilot Sport Cup 2 tires, adjustable exposed carbon fiber GT4 track wing and splitter wickers with integrated dive plane. The rear seat has been removed to make the Shelby GT 500 lighter.